Long awaited and an even more useful book for sales enablement and marketing professionals than The Challenger Sale. “The Challenger Customer, Selling to the hidden influencers who can multiply your results” is a “must-read” for all B2B marketing, sales and sales enablement professionals. This book is well written, well researched, often funny and I believe, more important than its predecessor, “The Challenger Sale”- see my review, because it busts more than a few myths about how to influence a B2B buying cycle. It has never been harder to create and win a new sales opportunity, where the sale involves a considered purchase of capital software, equipment or services and the outcome is a profitable deal for your company. The problem of course is that Internet has changed the way companies and individuals buy and consequently how the suppliers of technology products must sell. Digitally empowered buyers no longer need salespeople except in the final stages of the buying process when configuration, implementation and discounting questions arise. Unless the supplier has initiated the buying process, vendors will not be invited into a conversation until the buyer has already determined what they are prepared to pay. Short-listed vendors are invited to a bake-off and asked, or forced to discount their wares. Who needs this business, when your margin is through the floor or you lose money to win the deal? This is the reality that vendors of technology products and services confront daily. 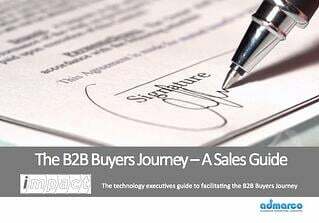 How then can technology vendors initiate and hope to influence a buying process, where buyers use up to a dozen information sources, including the Internet, consultants, peer reviews and social media in researching a considered purchase. Compounding this difficulty is a new reality where only 2% of marketing qualified opportunities result in a sale and the majority of forecast opportunities end in no-decision. To achieve a capital sale of products or services that creates value for your customer and provides a healthy margin for your company, you must initiate the sale. But it is not enough just to champion your solution. 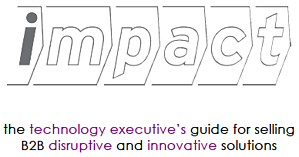 To create momentum, you need a compelling and differentiated “why-change” story. Then you must find a mobilizer in your ideal customer. Your marketing team must arm salespeople with commercial insight to connect with and teach buyers that status-quo is unsafe, costly and untenable. Your sales team must learn how to sell consultatively to deliver the insight and “teach” buyers to value a new perspective. Old school thinking on this was that you had to find and sell all of the key decision makers on the buying committee to win a major deal. The Challenger Customer debunks this idea. 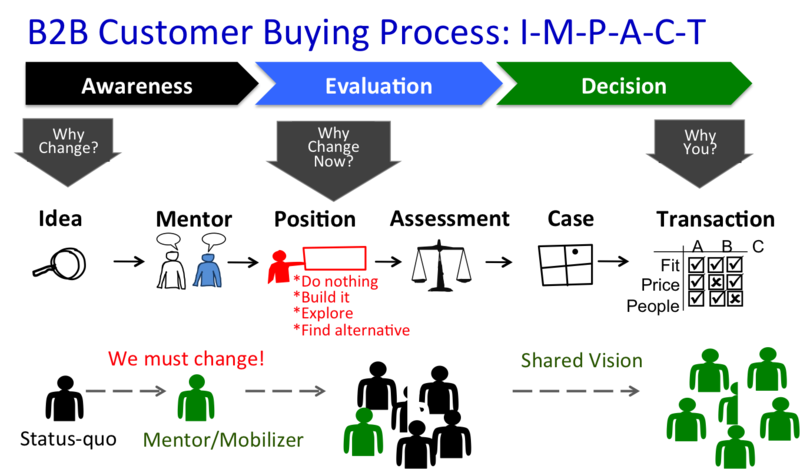 This image is from my presentation "Ideas from The Challenger Customer to Create Commercial Insight"
CEB research proves that it is more effective to identify and activate a “Mobilizer” to influence the 5.4 people on an average buying committee, than it is to sell each individual. The trick of course is to find a mobilizer/mentor/champion to pick up your cause and champion it through a buying process. Mobilizers come in three flavors; teachers, go-getters and skeptics. The other buyer types will take up your valuable time, but fail in building consensus to commit to a change and are unable to carry a buying team through a buying process. This is and always has been the challenge in consultative selling; finding a champion or strong mentor that can influence and carry a buying team through a complex process in what is often dysfunctional organization with no prior experience in buying solutions of the type you offer. The following presentation captures key ideas from The Challenger Customer that you can use to build comercial insight and a story that salespeople can quickly learn and use to challenge status-quo thinking. 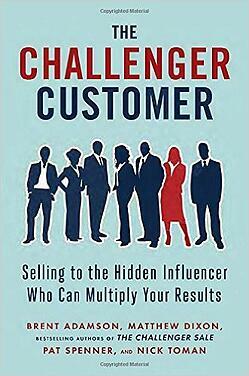 The Challenger Customer is a very important book for marketers and sales enablement professionals. I have read it twice and marked it up in many places. Ideas in this book are worth many times the price of the book! I am on my third read through.